It's been a week since I returned from Coachella and I'm finally feeling back to normal. It was fun but I'm happy to be back to my kale eating, pilates practicing way of life. Since I know what we all really care about is the fashion, here is a peak at what I wore (I only wish I had more pics!). For me, comfort is key when going to music festivals like Coachella. I packed my Rebecca Minkoff Mini Mac like a pro so I didn't have to carry much and left a chambray shirt in my fiance's locker for nights. I'm all about accessories, so one day I wore a simple black cotton maxi dress and layered on the jewelry and a cool Diesel hat to block the sun. Another I wore a Zoe Karssen tank and studded MINKPINK shorts. Highlights of the weekend included swing riding polar bears, cool art exhibits, people watching and first hand celebrity gossip. The low lights had to be the mobs of drunken kids, blisters and unexpected dirt storms. Back to the highlights. We got VIP tickets - I know fancy schmancy - but the truth of the matter is I hate huge crowds so it was mandatory. With the obscene amount of money we spent on tickets we got clean bathrooms, no lines, and lots of celebrity encounters. And yes, that is Kyle and Mauricio from The Real Housewives of Beverly Hills in the pic up above left - she was really cool and chatty and she shared her strong distate for a caste mate who shall remain nameless (here is a hint - she is Dutch and married to a music mogul...). So fun! You totally rocked the festival look–that tie-dye hat is pretty darn awesome! Thanks! The hat was a life savor when it came to the sun. So jealous you got to go! A friend from home went and I loved looking through all his photos! 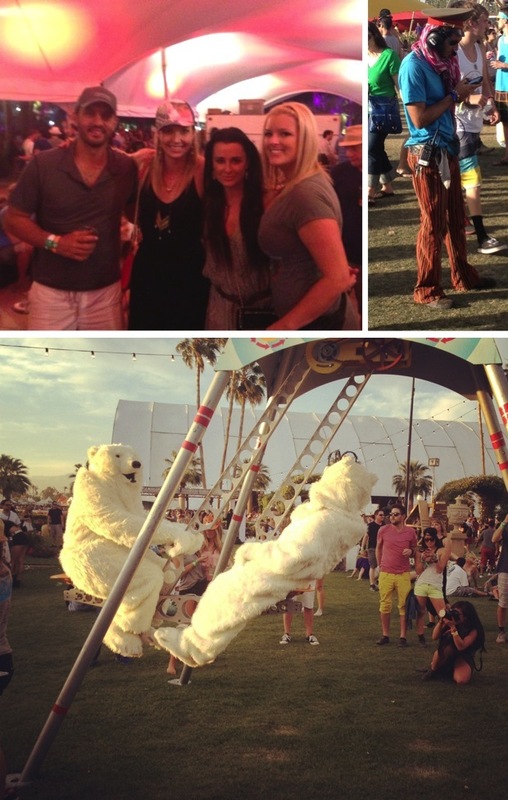 Whoa polar bears swinging and RHOBH?! So good, and I hear you about the large crowds VIP tickets are a must! Wow that was quite the adventure....having to meet Kyle & Mauricio in person! And you are truly in Coachella mode with your outfit & accessories!!! Looks and sounds like you had an amazing time.